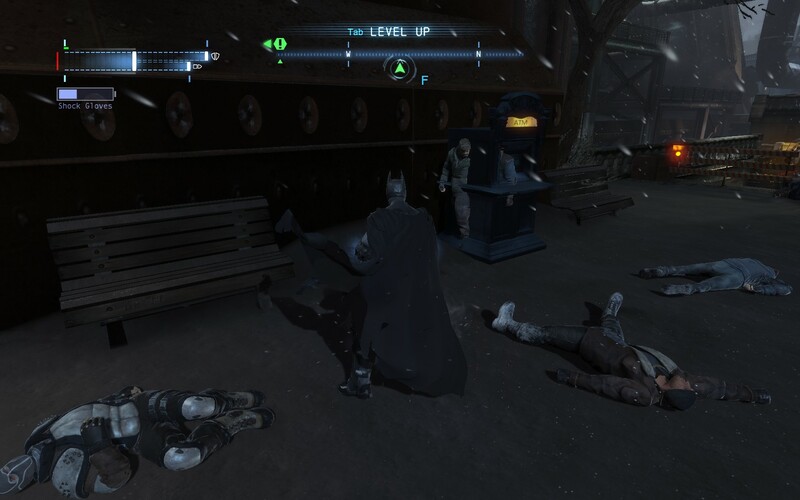 Batman Arkham Origins: We’ve Got To Stop Meeting Like This, Bats. Prior to the release of Batman: Arkham Asylum you’d be hard pressed to find anyone who’d heard of Rocksteady Studios. Primarily this would be because they only had one title to their name before that, Urban Chaos: Riot Response, which wasn’t badly received but at the same time you’d struggle to find anyone who’d played it. Their following two instalments using the Batman IP however catapulted them to fame and their success led to them being acquired by Time-Warner shortly before the release of Arkham City. 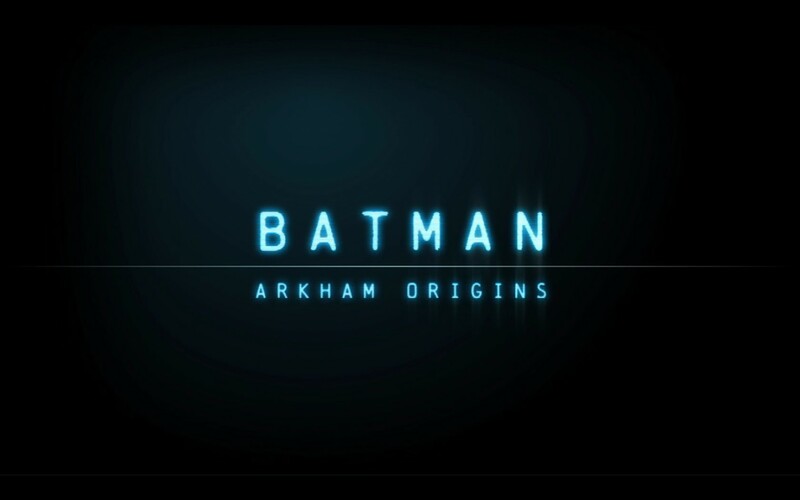 However the most recent instalment in this series, Batman: Arkham Origins comes to us not from the venerable Rocksteady but instead Warner Bros Games Montreal, a development house that’s familiar with the series (as they worked on the Wii-U port Arkham City). Combine that with the Joker no longer being voiced by Mark Hamill and fans of the series were decidedly nervous as there was no telling how this game would pan out. 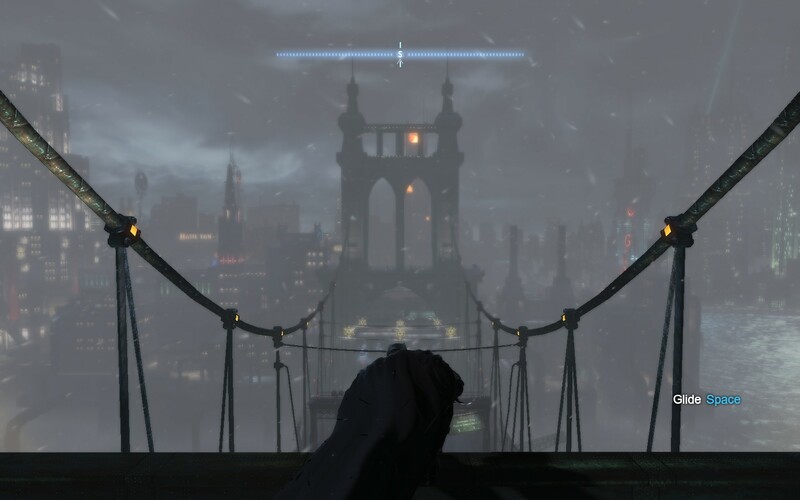 Arkham Origins takes place long before the world that was established in the previous two games, going back to the beginnings where Bruce Wayne is just beginning his journey as the caped crusader of Gotham City. He’s been at it long enough to attract the attention of some of the city’s more nefarious criminals and this has resulted in Black Mask, a notorious underworld dealer who’s eluded conviction due to the numerous businesses he runs, putting a bounty on Batman’s head. He has also invited 8 different assassins to go after the bounty including many of Batman’s long time rivals. Of course Bruce can’t sit idly by and potentially let others be put in danger for his sake and so begins a long Christmas eve spent putting the beat down on Gotham’s worst. Visually Arkham Origins is a small step up from its predecessor with the primary limitation of them progressing any further being the fact that it’s still being released on the current console generation. In all honesty though it still looks fantastic with all of the environments having an incredible amount of detail in them. I’m also somewhat thankful for this as my PC hardware is starting to get a little long in the tooth and whilst Arkham Origins looked great there were times when it began to noticeably slow down. However that wasn’t a frequent occurrence, even in the outdoor scenes where you could see far off into the distance. 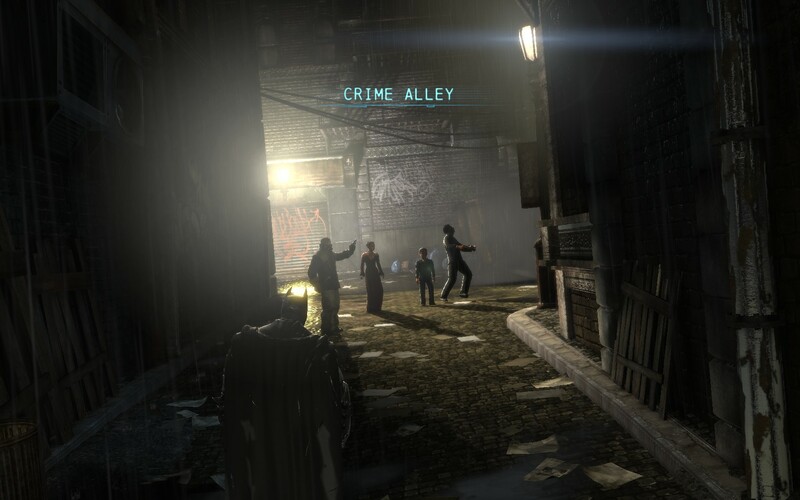 Just like the 2 Arkham titles before it Origins keeps the core game play and style the same whilst adding in additional challenges, enemies and tactics to keep it feeling fresh. You’ll still spend most of your time beating the every loving crap out of various different types of enemies, the challenge ratcheting up every so often with the introduction of new types of enemies requiring different techniques to take them down. However you still have the option of being a silent predator at times, swooping through an area and taking out multiple enemies without being seen. Finally the core puzzle mechanics make a come back, albeit with a new mode to make things a little more interesting. Combat, as always, is fast paced and meaty with every hit you land having a really satisfying feel to it. I always seem to start off feeling rather uncoordinated, getting my combos interrupted all the time by just not noticing the incoming attacks, but it doesn’t take long before I’m hitting huge multipliers and laying waste to everyone. One thing that has always irritated me is the initial lack of a way to take out large groups once you’ve knocked them all down as whilst you can do a ground take down on them all too often that results in you losing your combo string as it seems you can’t counter whilst in the middle of one. Later on of course you’ll unlock some better ways of dealing with them and after that combat starts to feel a lot more fluid. However one criticism that I’ll level at it, and this has been true of all of the series, is that as you progress through the story the number of different things you can do during combat start to become a little overwhelming. Pretty often you’ll find yourself facing a knife wielder, a guy with a riot shield and probably a tough enemy that needs to be stunned before you can do anything. These require no less than 3 different methods of taking them out and when combined with the dozen or so quick fire gadgets you end up having to remember so many things that you’ll eventually just settle on a couple. They all become somewhat moot however with the introduction of the shock gloves and then all you have to focus on is getting enough charge in them so then you can lay the smack down on everything around you. The stealth sections feel like they have remained largely unchanged although this could be primarily due to the fact that I didn’t invest many points in that skill tree until very late in the game. They’re still fun and somewhat challenging, especially the ones that have unique mechanics like the Deadshot encounter, but if you were looking for a markedly different or revamped experience you’re not going to find it. There’s also the possibility that I just wasn’t paying attention to some of the prompts and missed some new opportunities but I didn’t really have any problems accomplishing anything (unlike say in the Mr Freeze battle in Arkham City). 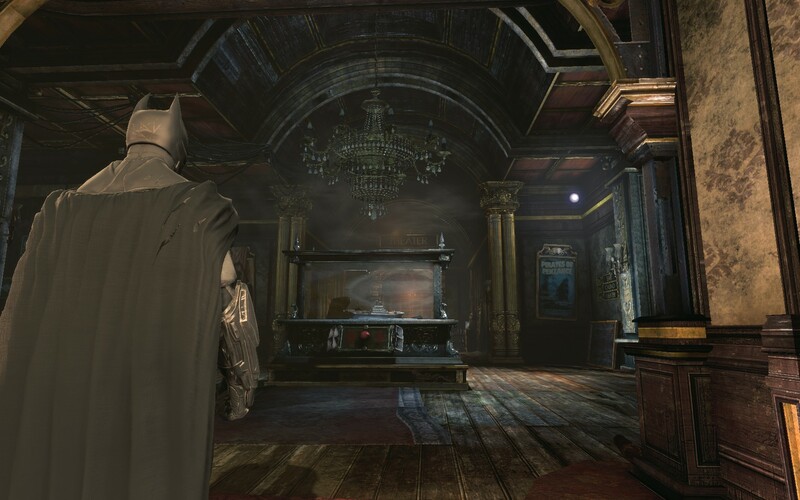 The detective mode/puzzles remain largely the same albeit making use of some of the new mechanics granted to you by the various gadgets that weren’t present in the previous titles. There’s also the addition of the crime scene mode which you use to reconstruct crimes to figure out details about how they happened and to track down the people responsible. For the most part it works well however it’s not made entirely clear when you have to move to a new section to continue the investigation, or what the expected behaviour is, so at first it was a little confusing. Still since it’s largely the same mechanic it still functions well even if it doesn’t feel as fresh or different as other aspects of the game are. However the real problem with Arkham Origins is that whilst it retains the essence of what made the Arkham series so good it’s also marred by numerous bugs and glitches, many of them that are completely game breaking. The screenshot above depicts one of them where upon using certain abilities with knock back you can cement enemies in a wall or other object. They then become unreachable and whilst I was able to dislodge them after trying every gadget I had (I eventually found I needed to get them on an edge and then attempt to stun them so they’d fall backwards out of the box) it was an incredibly frustrating experience. This is not to mention one part in the Penguin’s ship where all the external doors just simply refused to work, making the opening noise but not allowing me through. This broke my trust with all the game mechanics so I spent the vast majority of the game wondering if I had completed a challenge successfully or if I had just encountered another game breaking issue. I’m not alone in thinking this either as my searches into the issue revealed the list of bugs is scarily long and even after it’s been out for this length of time there’s no patch in sight. This, combined with the fact that Arkham Origins isn’t too much different from City in terms of overall play style, is probably the reason why there’s been such an abysmal reaction to it. I did my best to avoid any reviews prior to playing it however I unwittingly found out that Destructoid gave it 3.5 out of 10 and whilst I don’t agree with that score overall I understand the reasoning that went into it. Whilst I feel that Arkham Origins isn’t a bad game overall it is certainly the weakest of the series, showing very clearly that Warner Bros Montreal has a lot to learn before they can deliver a title that can be considered on par with the rest of the Arkham series. Whether or not they’ll get the chance to do so in light of the current reaction to Arkham Origins though remains to be seen. As for the story I felt like it was a great introduction into the relationship between Batman and the Joker as whilst their relationship has been explored in depth in other mediums it was great to see how the rivalry began. The bucket list of other characters thrown in as assassins was unfortunately less well done as it just felt like a convenient way to throw them in without needing a coherent reason for them to be there. This was only exacerbated by the fact that they either had long, drawn out encounters (like Enigma) which just weren’t that fun to pursue or they were so short (like Anarchy) that you really didn’t have time for them to develop. Should we judge Batman: Arkham Origins without the knowledge of the titles that followed it previously it would be easy to heap praise on it. 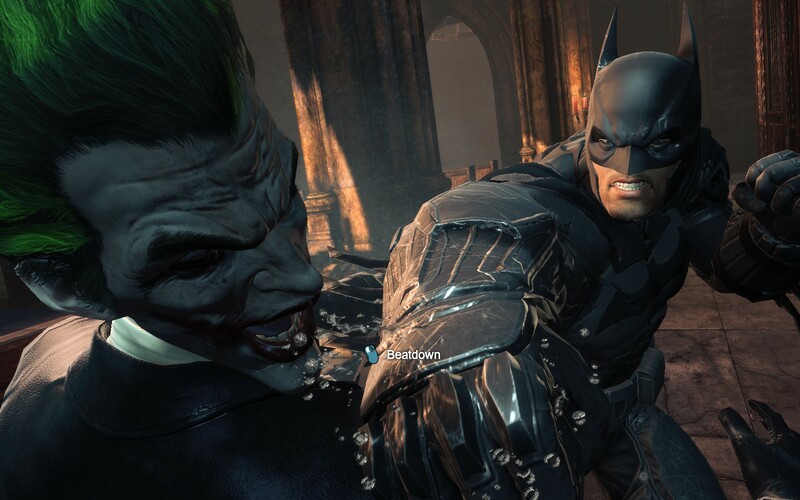 The combat is engaging and satisfying, the exploration into the relationship between the Joker and Batman is intriguing and the world is filled with detail that few games manage to achieve. However it’s lineage set a high bar for it to live up to and the fact that it’s not different enough from Arkham City, combined with the numerous game breaking bugs, means that Arkham Origins is the weakest of all of the titles. I certainly enjoyed my time in it but there’s no mistaking that the developers behind it have their work cut out for them if they want to live up to the Rocksteady brand. Batman: Arkham Origins is available on PC, Xbox360, PlayStation 3 and WiiU right now for $59.99, $78, $78 and $78 respectively. Game was played on the PC with 13 hours of play time and 26% of the achievements unlocked.